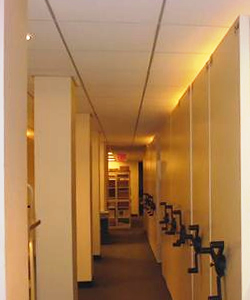 Many commercial offices contain a mailroom. A mailroom is a space for organizing and maintaining any and all mail. The space manages the incoming and outgoing mail. Businesses that commonly require a designated mailroom are schools, offices, and residential buildings. In commercial buildings, many mailroom have employees known as, mailroom clerk or a postmaster. A mailroom clerk is responsible for maintaining and preparing any incoming and outgoing packages. The mailroom clerk ensures the mail and packages are sent by the appropriate carrier. A large business relies heavily on the mailroom being the centralized internal mail system. A postmaster, the manager or supervisor, is employed along with a mail clerk. The mail clerk is responsible for delivering mail and packages to the employees throughout the building. A mail cart or trolley may be used to assist in mail delivery. For a smaller business, a mailroom and breakroom may be combined to save on space. 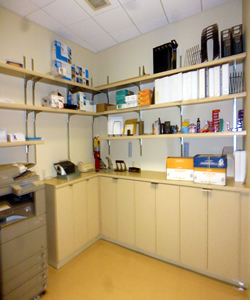 A combination mailroom and break room will contain an area to take a break and pigeonhole mail sorters. The space may also offer a coffeemaker, microwave, refrigerator, pantry, table and chairs. The main function of a mailroom is to take in and organize any mail and packages. A mailroom also should ensure the mail gets to the proper person. A mail clerk will maintain a record of incoming and outgoing mail and packages. This may include filing records and other data entry. If your business requires a mailroom in Manhattan, contact our brokers to assist in your search. Our brokers are knowledgeable on the available spaces and buildings in New York City to meet your requirements. We are here to help you find the perfect space at no obligation or fee.